Ever tried to find good fitting mittens that aren’t a pain in the rear to put on your small toddler? None of them are small enough to fit their tiny hands well. BUUUUT… I struggled to even find a crochet pattern that worked, so I designed my own! 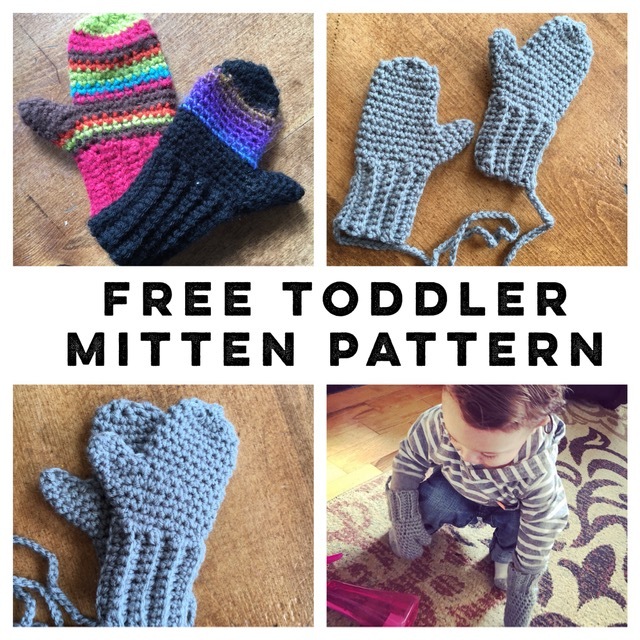 I have used this pattern for a couple of years and made MANY mittens for my kids and my friend’s and family’s kids as well. They are amazing! Pattern is for Toddler (1-2T) and Preschooler (3-5T). I didn’t bother writing the pattern for any older kids because by the time they were 5 or so they preferred gloves and by that time gloves fit well enough to be useful. Notes: Work in rounds now using a stitch marker. Do NOT join at the end of rounds. Finish off leaving long tail to sew up hole at top. Join at thumb hole on first skipped stitch time round 6, ch 1, Sc in same as joining and next 6, (insert into last skilled stitch and PUL, insert into hand portion of glove and PUL, insert into first st of this round and PUL, YO and pull through all loops, place stitch marker. Finish off leaving long tail to sew up hole at end. Join at thumb hole on first skipped stitch time round 6, ch 1, Sc in same as joining and next 7, (insert into last skilled stitch and PUL, insert into hand portion of glove and PUL, insert into first st of this round and PUL, YO and pull through all loops, place stitch marker.